Psalm 119 stands out from the other chapters of Tehillim in terms of both its length and the sheer beauty and richness of its content. This chapter follows an alphabetical sequence, consisting of a series of eight verses – all with virtually the same meter and rhythm – for each of the twenty-two letters of the Hebrew alphabet. In effect, this Psalm is actually a composite of twenty-two brief poems, every one of which consists of eight verses that begin with the same letter. 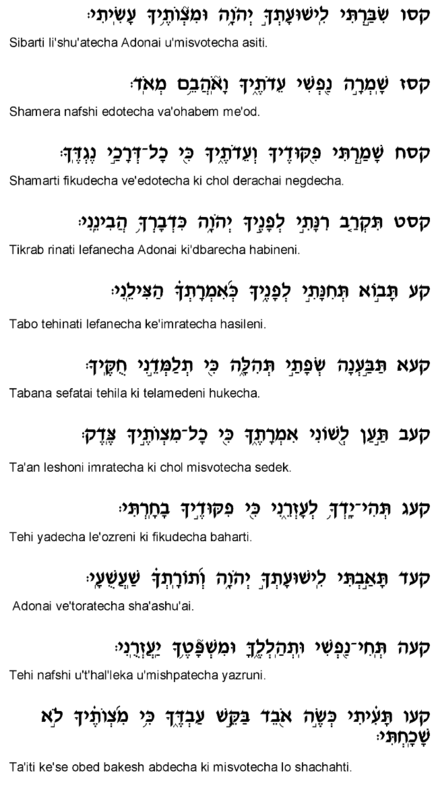 A number of commentators have observed that almost all of the 176 verses in this Psalm contain at least one of the following terms referring to the study or observance of Torah: "Derech" ("path"), "Torah," "Edut" ("testimony"), "Pekudim" ("ordinances"), "Amira" ("divine statement"), "Hok" (statute"), "Misva" ("commandment"), "Mishpat" ("law"), "Davar" ("divine word"). Indeed, the primary theme that very clearly runs throughout this entire chapter is David's love, reverence and high regard for the Torah. He speaks here in praise of those who observe the Torah, as well as of his own efforts to fulfill God's commands. Many verses in this chapter express a heartfelt prayer to God to assist him in understanding and practicing the Torah. He desperately seeks God's help in his quest for comprehensive Torah knowledge and perfect compliance with its laws. For David, Torah knowledge and observance were the most precious assets on earth for which he was prepared to expend immense efforts, make great sacrifices, and offer heartfelt, tearful prayers to the Almighty. One particular theme that recurs throughout this Psalm is the scorn and ridicule David endured as a result of his unyielding commitment to the Torah. In verse 23, for example, he describes the noblemen who would speak derisively about his unquenchable thirst for Torah knowledge. 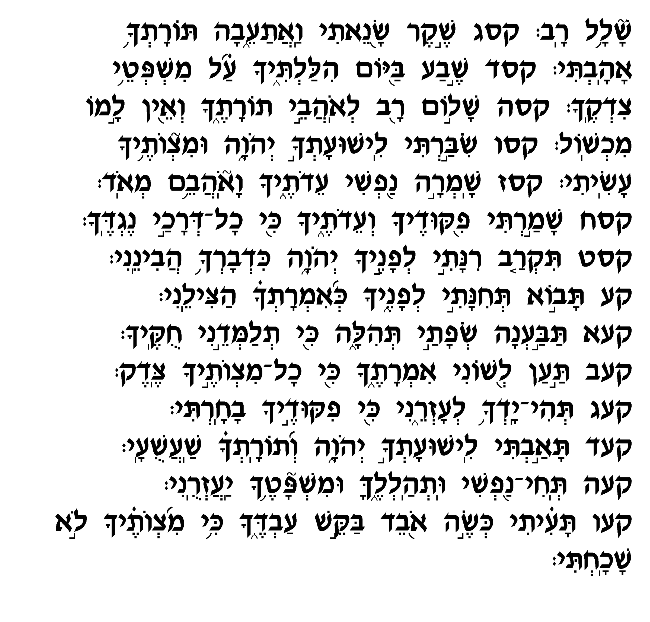 And later, in verse 51, he records the mockery of the "Zedim" ("evil ones") who sought to intimidate him, but could not diminish his passion for Torah. These adversaries went so far as to spread false accusations against David, yet he persisted in his efforts to study and observe the Torah (verse 69). As he explains in verse 161, even when he was pursued and persecuted, his primary fear was the fear of God. A person who fears God more than man is not intimidated by the ridicule or threats of those who oppose his religious commitment. Hence, David could not be dissuaded by the hostile enemies who resented his love for Torah and Misvot. Additionally, on several occasions throughout this Psalm David speaks of the joy and comfort he received from learning Torah and observing the Misvot. As he regarded Torah study and practice as man's greatest privilege and most valuable commodity, even under the harshest circumstances he could find comfort in learning and fulfilling Misvot. In one of this chapter's more famous verses, David declares, "Had Torah not been my delight, I would have thus been lost in my suffering" (verse 92). David's love of Torah prevented him from falling into despair and self-pity, as it provided a constant, unending source of joy and a feeling of accomplishment. This Psalm should thus inspire us to engender within ourselves this same attitude towards Torah and Misvot, as life's greatest joy and privilege. With this outlook, a person will never despair or feel despondent during difficult times, as he will always have the Torah to look to as a source of meaning, happiness and a sense of purpose.